Thanks to the guidance and support of committed adult 4-H volunteers, the California 4-H teams have placed first in the National Avian Bowl 19 times, and second 7 times since 1989. See the full list of results. This year, besides California, there were 12 other state teams vying for the title of National Avian Bowl Champions. Other states that were represented were Alaska, Alabama, Georgia, Florida, Kentucky, Ohio, Indiana, Wisconsin, New York, Minnesota, Pennsylvania and Illinois. 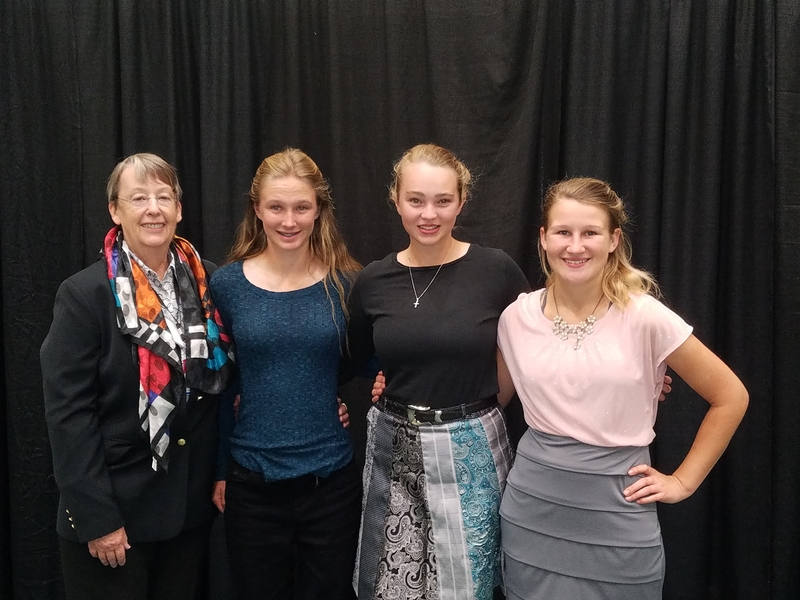 Our 4-H Avian Bowl team took first place in the National Avian Bowl competition, held November 15-16, 2017 at the 2017 National 4-H Egg and Poultry Conference in Louisville, Kentucky. What's unique about our Avian Bowl team is that they have to coordinate with each other remotely, since they are from different clubs and counties. Congratulations to Abby Milanesa of Buena Vista 4-H club, Kayla Hurt from Paso Robles and Siana Barrett from Dos Palos for their great accomplishment! What was it like to compete? The Avian Bowl for California has been driven by Dr. Francine Bradley, who retired from UC Davis a number of years ago. With her students at UC Davis, she used to put on amazing Poultry Info Days for 4-H members. She still puts on the qualifier in Fresno and still travels to the Bowl in Kentucky. She is the drive behind California winning so often! An Avian Bowl is a double-elimination knowledge bowl based on poultry-related subject matter. 4-H members from any state who want to compete must use the Clemson University study guide to prepare and have at least 2 team members. This year's topics included embryology, biosecurity, understanding food poisoners and several other avian subjects. Each state hosts a qualifier event in which senior teams (14-18 year olds) compete against each other. Questions vary and team contestants must use a buzzer to answer the questions to earn points. In addition to competing in a national competition, the participants also have the opportunity to meet people from many other parts of the country, hear from experts in the poultry industry, and tour many well-known sites such as Churchill Downs and the Louisville Slugger factory. These activities are sponsored by the poultry and egg industry as part of the conference. The conference also features Poultry Judging contests, an Egg Preparation contest and Chicken and Turkey BBQ contests for hundreds of qualified teenagers from across the United States. 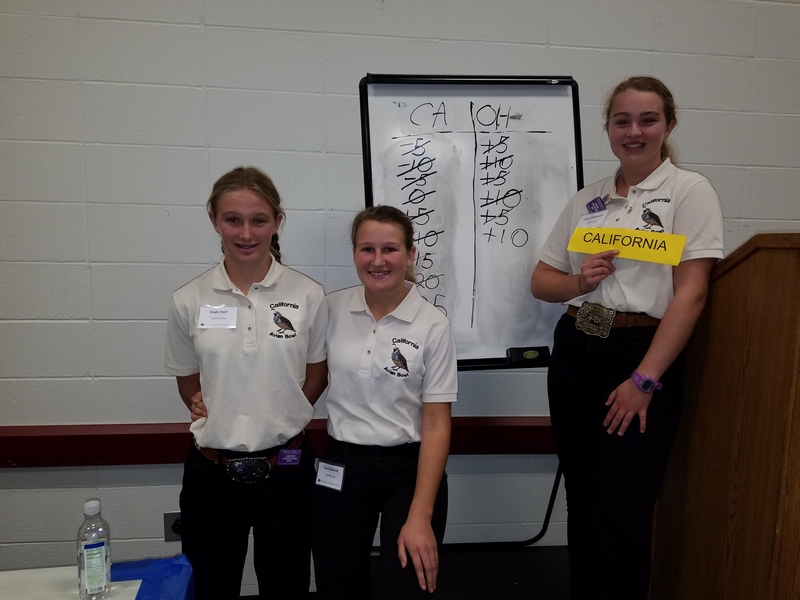 See our past blog post, "California 4-H team goes to Nationals" to read more about competing at the National Avian Bowl. If you would like more information about 4-H avian projects, please contact DeAnn Tenhunfeld at dtenhunfeld@ucanr.edu.